“The name Edgewater Glen is a modern one, created in the early 1970s when residents were forming a neighborhood association and needed a name for their organization that reflected the neighborhood. Glen was chosen because it was the first syllable of two intersecting streets in the neighborhood – Glenlake and Glenwood. While the name is modern, the sense of being a separate neighborhood is not, and probably goes back as far as the early 1920s or even before. As Edgewater matured in its development west of Broadway, the Edgewater Glen neighborhood became an island of predominately single family homes bounded on the north and south by areas where the housing stock was predominately two-flats and larger buildings. That dynamic is still true today. Prior to its being subdivided into lots for housing, Edgewater Glen was farmland. West of Glenwood was the northern portion of the farm of Nicholas Kransz, Edgewater’s first non-native American settler, who lived in a house at the northeast corner of Ridge and Clark called Seven-Mile House, reflecting that it was about seven miles from Chicago’s city hall. To the best of our knowledge, it was Edgewater’s first house. East of Glenwood were narrow slices of land running from Glenwood to Broadway that were separately owned. The east half of Edgewater Glen was subdivided first, beginning in 1890. The first and second subdivisions (in order of their recording with the Cook County Recorder of Deeds) were subdivided by Thomas G. Milsted. The first of Milsted’s two subdivisions included both sides of Glenlake (recorded June 17, 1890). The owners, however, were shown as Isedore Poetke and Charles W. Fullerton. The second included the south side of Hood (recorded December 22, 1890). The third subdivision was called the Brost and Kemper addition to Edgewater. It ran from the south side of Granville down to and including the north side of Hood. It was recorded April 4, 1892. The last of the eastern half subdivisions was by John Lewis Cochran, Edgewater’s founding father. It was called Cochran’s fourth addition to Edgewater and included both sides of Norwood and the north side of Elmdale. It was recorded August 13, 1893. Though called the fourth addition it was actually Cochran’s fifth subdivision – and both his smallest and his last. To complicate matters somewhat, Milsted’s first subdivision was re-subdivided by others later. The west half of Edgewater Glen – the Kransz farm – wasn’t developed until after the turn of the century, and it was developed by the Kransz family itself, rather than being sold to someone else to develop. The first Kransz subdivision in Edgewater Glen was recorded April 8, 1903, and included the land from the north side of Glenlake up to and including the south side of Granville; the second Kransz subdivision was recorded October 12, 1904, and included the land from the south side of Glenlake down to and including the north side of Elmdale. For both Kransz subdivisions, Nicholas’s widow Margaret was recorded as owner of the land and her son Henry as the notary public. As one would expect, given the fact that the east half was subdivided between 10 and 13 years before the west half, the first houses were constructed in the east half. 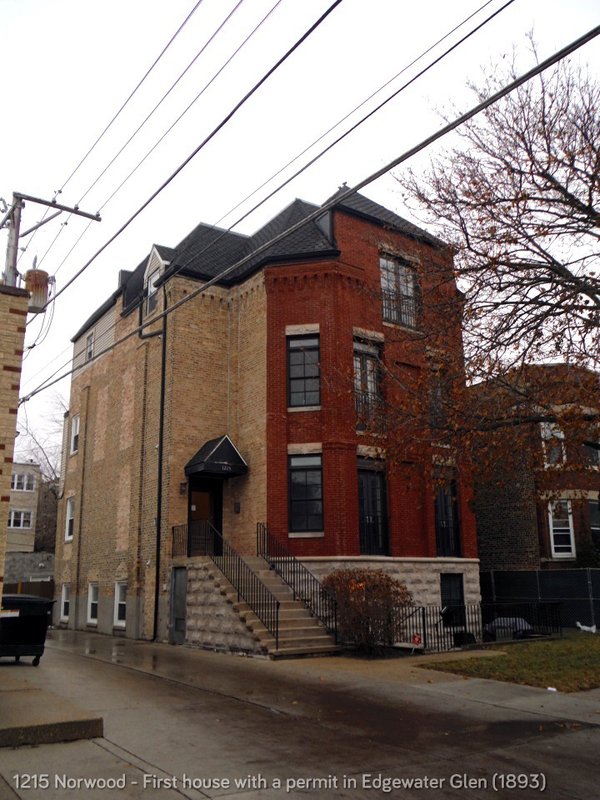 The first Edgewater Glen house for which a permit has been found was 1215 Norwood. The permit was issued November 2, 1893. While the first houses were constructed in the east half, there were very few. Growth was very slow. There was a depression in 1893 and there were many lots available for sale, not only in Edgewater Glen but throughout Chicago and its suburbs. As a result, not much got built. Prior to 1900 there were only 14 residential structures in Edgewater Glen – all in the east half – and all but four were on Norwood in Cochran’s fourth addition. Of these structures, five were built by Cochran for resale. Just a few years later, however, the picture would change dramatically. Now it would be the west half that was more developed. The 1904/1905 Sanborn fire map gives a snapshot of development up to that point in time [click here to see a PDF image]. There were 96 residential structures – 34 in the east half and 62 in the west half. But development would be concentrated. In the west half, all the development was on Granville and Hood – none on Glenlake and none on Norwood. In the east half, there was only one house on Glenlake – the house at 1246, which is also shown on the 1887 Rascher fire map, and which apparently was a farm house that was left in place. All of the present day streets are shown on the map (though some by earlier names), but Glenlake is shown as “not open” from Clark to Broadway. The same was true for Norwood west of Glenwood and for Glenwood itself. What accounted for this dramatic change? Again it was the Kransz family. Not only did they subdivide their farmland, they built houses on it for resale, similar to what Cochran and W.H. Cairnduff had done, but they did so in a more intense way. Shortly after the first subdivision was recorded, permits for nine houses on Granville were issued to Margaret Kransz. In September 1903, four permits were issued to the Weber, Kransz & Company for a total of 45 houses – all on Hood Avenue. Also in September, permits were issued to the Weber, Kransz & Co. for five additional houses on Granville. Together, these permits issued in 1903 to members of the Kransz family represented 59 houses – an Edgewater record for the number of houses permitted in one year to one entity. This action, probably more than any other, established the pattern for Edgewater Glen as a neighborhood of predominately single family homes. The Weber in Weber & Kransz refers to Bernard F. Weber, who married Annie M. Kransz, daughter of Nicholas, Sr. The Kransz in the company appears to be Henry P. Kransz, one of the three sons of Nicholas, Sr. The company was thus very much a family affair. The period 1905 through 1912 was the greatest period of growth in Edgewater Glen. It was during this period that Roy E. Knauer built 36 houses in the east half, all but six on Glenlake; and it was during this period that the Kransz family developed their second addition, this time primarily by Nicholas’s son Henry. Both Henry and Nicholas, Jr. lived on the land that their father had farmed: Henry at 1519 Hood and Nicholas, Jr. at 1502 Glenlake. It was also during this period that transportation to the downtown business district greatly improved. The long awaited – and long delayed – extension of the Northwestern Elevated Railway from its previous terminus at Wilson avenue through Edgewater (at ground level) to Evanston with a stop at North Edgewater (Granville) was opened on May 16, 1908. Prior to that, the principal means of getting downtown was the St. Paul steam railroad with its stop at Granville (over the same route north of Wilson). A permit for the construction of a station was issued in October 1890 and there is documentation that it was open as early as April 1891. For more information about the Kransz family, J.L. Cochran, W.H. Cairnduff, 1215 Norwood, homes on previous home tours and the development of Edgewater generally, please visit our website: http://www.EdgewaterHistory.org. It is fully searchable. In our write-up, we used the names by which the streets are known today. Originally, Broadway was Evanston Ave, Elmdale was Peterson, Glenwood was Southport, Granville was Grand, and Greenview was Perry. “The Edgewater Glen neighborhood took its name from the Edgewater neighborhood and the prefix of two of its streets, Glenwood and Glenlake. When the area was first settled, it was an area of Lakeview township which had been founded in 1859 at a meeting at the Andersonville School (Foster and Clark). Then, in 1885, John Lewis Cochran, a tobacco salesman from Philadelphia, bought a plot of land along the lake shore from Foster to Bryn Mawr and named it Edgewater. During the next five years, he made subsequent additions to his beautiful suburb along the shoreline to Devon Avenue. In 1886, the county put through a road on Granville to the lake shore. In 1889, all of Edgewater was incorporated into the city of Chicago.